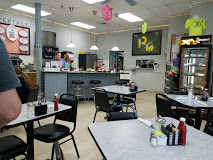 Family friendly diner serving breakfast all day. Open for dinner Mondays and Thursdays as well. Standard diner fare, overstuffed omelets, comfort food, homemade soups, homemade desserts. Come try our Flapjack Attack Pancake Challenge! Can you eat it all? !